Minnesota Department of Natural Resources, 9780975433836, 164pp. For everyone who enjoys attracting wildlife to their backyard, farm, woodlot, or lakeshore home, Woodworking for Wildlife is the perfect resource. With all the latest information on how to attract everything from bluebirds, chickadees, purple martins, and wood ducks to bumblebees, toads, owls, and woodpeckers, the book features thirty designs for nest boxes and nest platforms that will accommodate forty-six species of wildlife. It provides easy-to-follow diagrams for cutting out and assembling the nest boxes, accompanied by over three hundred beautiful color photographs. 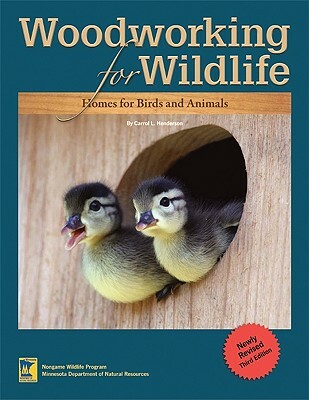 Carrol L. Henderson has dramatically improved and expanded the book with the best techniques for building, placing, and managing nest boxes. He provides new information on how to eliminate predation on nest boxes by raccoons and cats, as well as how to reduce competition from exotic species such as house sparrows and starlings. The book also includes new designs for houses for flickers, great crested flycatchers, toads, bumblebees, buffleheads, and purple martins. Woodworking for Wildlife is a great reference for backyard wildlife enthusiasts, conservationists, youth group leaders, teachers, woodworking instructors, and parents and grandparents who are looking for outdoor projects to do with children.